My holiday blogging fell apart a bit, so I’m just going to post some highlights, probably out of order. 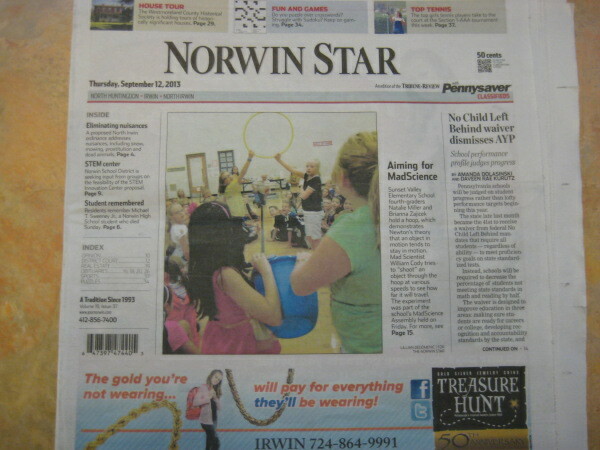 The craziest part of my holiday was when I hired a car,and drove 200 miles West (and a bit North) from Washington DC, to the place they call Norwin! 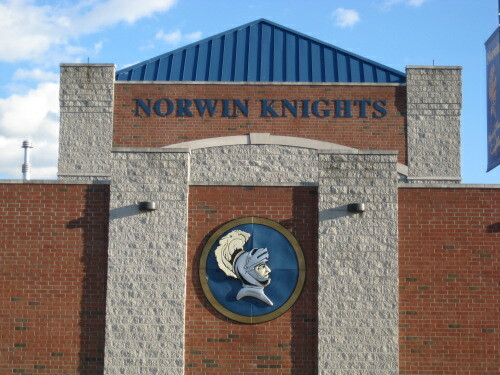 I found out about Norwin from google I suppose, when vanity googling used to return things about Norwin High School, so I have been aware of it as a place for some time. But when I decided to visit New York and Washington, it was just close enough to go and see it for myself. And I am pleased to say that I was impressed! Given that I am 40 now, I guess I was just lucky for the first 10 years. I have to admit that I did spend quite some time taking in the sight of my name in so many places. 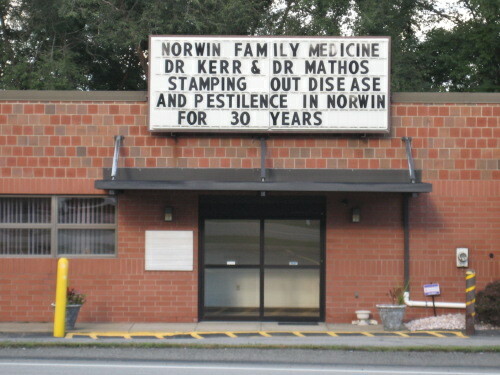 Though in the end I was more freaked out by the lady in the library who answered the phone saying “Norwin Library – how can I help you?”, as I of course immediately turned round to see why she was talking about me. I was especially pleased to manage to take photographs around a school without getting arrested for being suspicious! 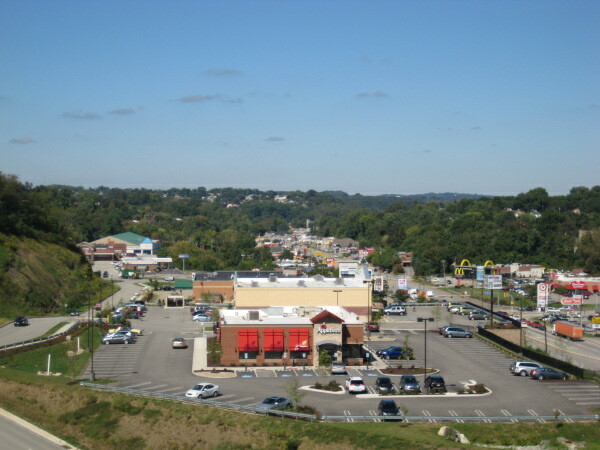 Okay, Applebees isn’t so picturesque, but the background is beautiful. 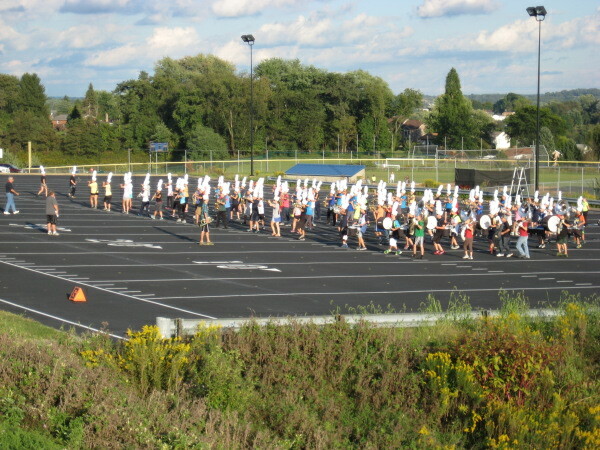 So in summary, I really enjoyed my trip to Norwin. 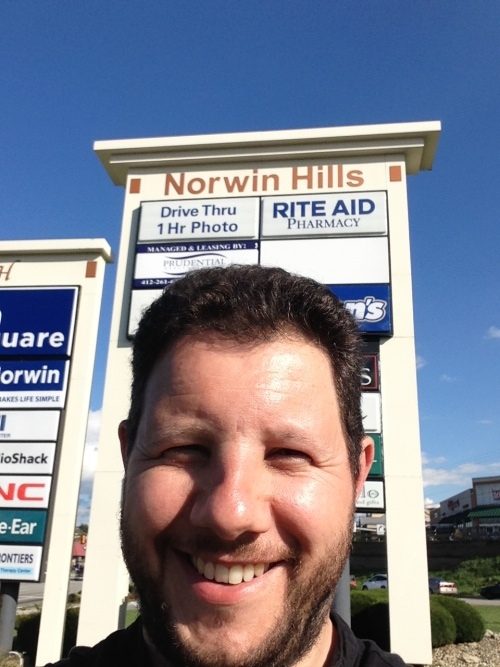 It’s fair to say that the good people of Norwin were not overwhelmed by my presence, but that’s okay – not many people are! A few of them were impressed by the distance I had come to visit their town, but on the other hand the receptionist in the hotel didn’t comment at all when I checked in. But I don’t care – I am so glad I went there – I was genuinely impressed by it, and I might just go back some time. I’ve now moved on from New York to Washington, where my hotel wants 13 dollars for WiFi, which I’m not paying, so there’s a bit less internet in my life. So, on my last day in New York, I got on the Metro and went all the way to the to of Manhattan, since I’d been to the bottom earlier. I then walked across the Broadway Bridge, and into the Marble Hill district of the Bronx. It’s quite different to the one in Donegal, not unsurprisingly. Then on to FAO Schwarz, New York’s legendary toy shop. I have to admit, it was excellent, and I did spend quite some time there. But to be honest, the highlight of my last day in New York was seeing Matilda. Seeing a Broadway show isn’t cheap, but it was completely worth it – it is a marvellous show, which has all the charm of the book and the film, with splendid new songs from Tim Minchin. I can’t recommend it highly enough! Then back to my hotel for the last time, the packing of the case, and early on Wednesday I got the train to Washington DC. The train was very civilised – I got a seat facing the right way, and there was free WiFi all the way, so I was able to track our progress by Google maps. We seemed to pass through a lot of states – New York, New Jersey, Delaware, and finally into DC. Spent a very hot afternoon exploring the basics of Washington – the White House, the Lincoln Memorial, and a bit of the National Mall. Nice Japanese for tea. Today, I went to the Capitol, then to the Smithsonian Air and Space Museum. What an astonishing place it is! When you walk in through the door and see so many historic planes and space ships sitting and hanging in one place, it’s a little jaw-dropping. I spent quite some time there too! And then we had heavy rain for a while. I’m very impressed with the Capital Bike Share scheme, which I’ve been making use of. Cycling looks to be pretty safe, and for a 10 dollar membership for 3 days, I’ve already used 4 or 5 bikes. Hopefully will find somewhere to upload this tomorrow. In the meantime, goodnight internet! Four days of walking around New York has left me with pretty sore feet. No blisters, just soreness. So today I did the sensible thing and had a lie in, giving my feet a bit of extra rest. That meant I missed the breakfast in the hotel, and had brunch up the street instead, only some of which I spilled down my shirt. Then got the subway uptown, walked across Central Park, and went to the Metropolitan Museum of Art. As is so often the case, I went in fairly confident that I’m not into art, so it wouldn’t take too long. But the first section was Egyptian, and they had artefacts from places I had visited, so it was very compelling. They even have a complete temple, moved from Egypt and rebuilt in a beautiful large room. And that was just the start – from there it went on to Greek and Roman sculpture, paintings, armour worn by Henry the 8th. 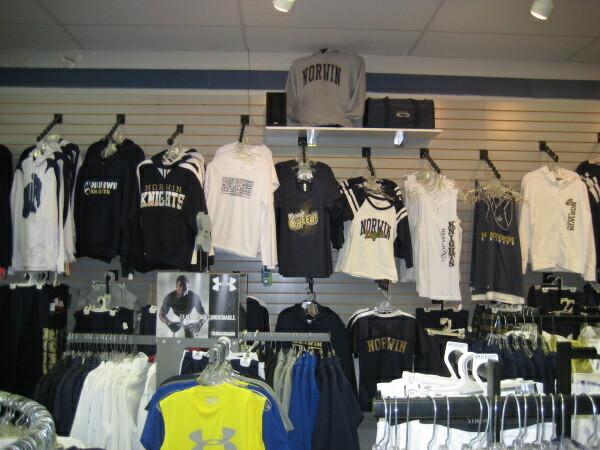 Every section had something interesting to see. Especially the roof garden, where the view was splendid. But not as splendid as from the top of Rockefeller Tower – it not only has spectacular views of the city, but also has a few seats so you can relax and enjoy them a little more, which was very nice. Dinner was very nice tonight too, at the Olive Garden. Plus I successfully managed to use the bus to go back downtown! It’s Sunday, so I had to get up a little earlier in order to make it out to church. There are lots of churches in New York, but I decided to go to Redeemer Presbyterian on West 83rd Street. It was a nice service – no robes or choir and quite informal, but a bit more liturgical than I am used to. The sermon was on wisdom from the start of the book of Proverbs, and was very good. I came back to my hotel, since I had to pass by anyway, and grabbed the belt I had forgotten to put on earlier. A burrito for lunch, and then on to USS Intrepid, an old aircraft carrier that houses New York’s aerospace museum. The ship is pretty impressive itself, but it’s interesting that it houses two examples of obsolete technology that haven’t been replaced with something better. The have the Space Shuttle Enterprise, the prototype that didn’t go into space but proved many of the technologies, and they also have a Concord. Both technical triumphs of their time, and both now retired without really being properly replaced. Feet really sore after yet more waking around, so gave them a bit of a rest back at the hotel before a very delicious dinner at the Red Lobster. Today, I took a more traditionally touristy path, and did some of the iconic new York landmarks. Rather than starting the day with a long walk, I got the subway downtown (as they say round here), to the bottom of Manhattan. 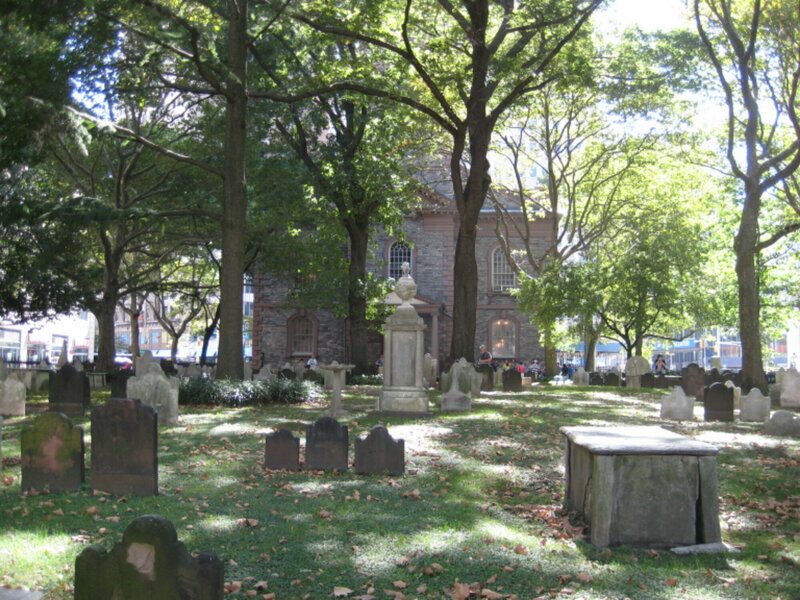 I had planned to start with the World Trade Centre memorial, but as soon as I came up from the subway, I found myself beside a lovely old church, and had to go in for a nosy. I was stunned to find that this 18th century church had been just opposite the Twin Towers, and not only survived but became a relief centre for the rescue workers. They provided beds, podiatry, counselling, and just about anything else they could – it was so moving to combine such a beautiful and peaceful little churchyard with that tragic story, and to make something positive from it. 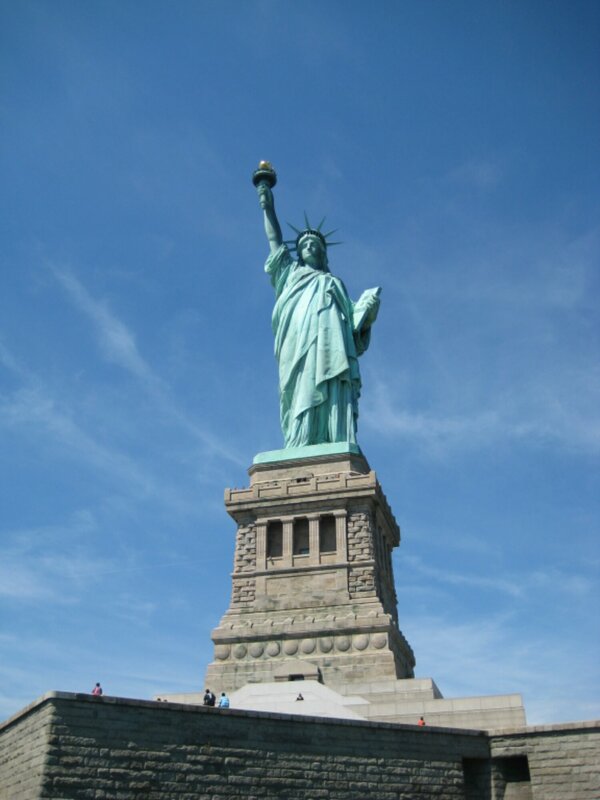 I then got the ferry over to Liberty Island to see the Statue of Liberty. It really is a beautiful piece of work – I love the deliberate contrast with the ancient Colossus or Rhodes, as the statue is not a symbol of strength and power, but rather a symbol of hope and freedom. It’s genuinely moving to hear the “bring me your poor, your huddled masses yearning to be free” on the audio guide as you look up at her. Unfortunately, I didn’t get to go inside, as there were no tickets available. The other thing that struck me is how far it is from Manhattan – she does not loom over the city skyline at all – you can only just see her in the distance, which surprised me given her size. 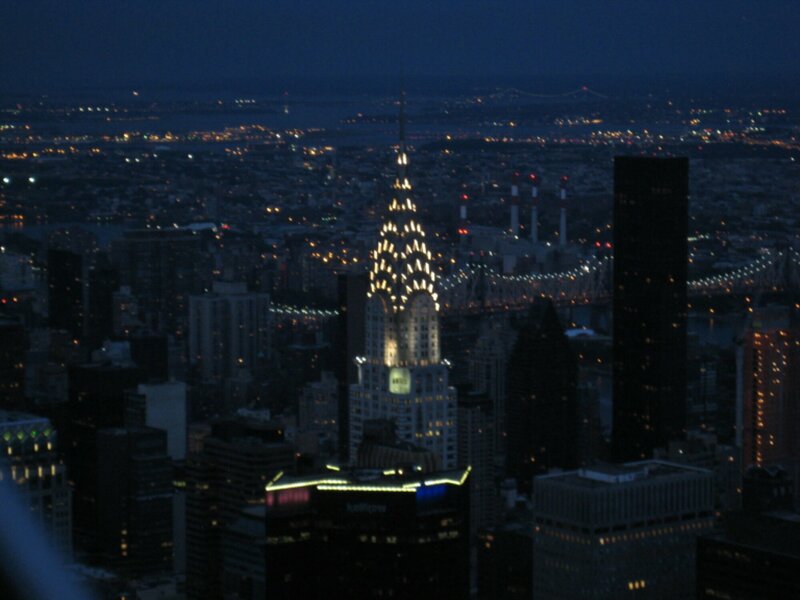 And then as dusk was approaching, I went up the Empire State Building, another symbol of New York. It is a lovely building, and the views from the top are fantastic. They are also pretty much unphotographable with my cheap camera, which doesn’t handle low light very well. Oh well. At least I got to see them. No, actually I seem to have a fairly good picture of the Chrysler building, which I think is probably the nicest building in New York – it is striking from below as well as above, during the day and at night – I took lots of pictures of it yesterday too. Today I headed out along 40th street to see what I would find there. 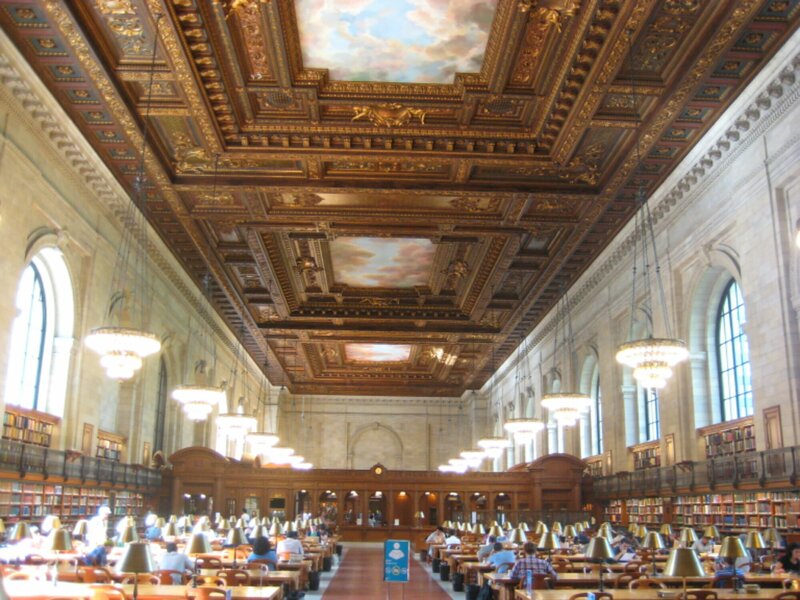 I was delighted to come upon the New York Public Library – a cathedral to the written word if ever there was one. A beautiful building, but a working one, with lots of people reading away in its lovely surroundings. And yes, it still looks like it did in Ghostbusters all those years ago. Then more books, when I found Barnes and Noble on 5th Avenue. St. Patrick’s cathedral was a disappointment, as they have the builders in. The Lego shop in Rockefeller Plaza was not. 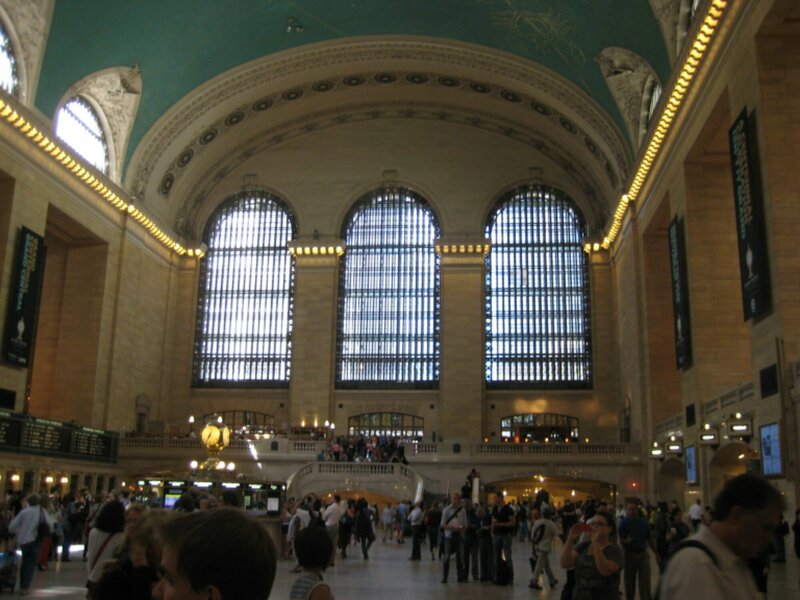 And nor was Grand Central Station, which is a magnificent building, where I stopped to have lunch. The biggest surprise about the UN Building was that there were only 3 lone protesters outside – I had expected to see lots of people there showing there concern about Syria, but there were none. I looked upon the Guggenheim Museum, but decided that while I might like the building, I didn’t want to look at the modern art, so I gave that a miss. Likewise, I walked past the Metropolitan Museum, but for the opposite reason – I will go back there when my feet are up to it! Will add some photos to this when I get a chance – actual camera to android tablet can be tricky you know! (Photos now added thanks to my Transformer tablet, with its very handy SD card slot in the keyboard). In other news, I passed a number of Jewish activities, and it seems that today might be the Jewish New Year, and I think it said the year was 5574, out something like that. So happy new Jewish year to y’all! Hi internet. First a word of explanation – this is officially my holiday to celebrate my fortieth birthday. It was originally booked for the day after my birthday but it had to be delayed for a few months while my leg strengthened again. So, it’s my birthday holiday. Day one was spent travelling – Belfast City Airport to London Heathrow, then a bit of a wait, then Heathrow to New York’s JFK. As usual, I am appalled by the fact that Heathrow runs on buses – Terminal 5 is the newest, most state of the art terminal at Heathrow, but you still have to use a bus to get there. I also discovered that Wagamama’s curry is hotter at Heathrow than Belfast – not quite as nice, I would say. My flight was delayed due to security problems with the food. But once we got going, and i was eventually able to get my screen working, I was able to enjoy some in-flight movies. I liked Monsters University – the classic story of the underdogs achieving the impossible, and two enemies working together and becoming friends. After Earth was poor – I know I was a bit tired, but it is a bit dull. I gave up on it. Robot and Frank was very good – a surprisingly touching story of the friendship that develops between a man with an interesting past but a failing memory and his home help robot. Also watched the first episode of the new American remake of House of Cards, starring Kevin Spacey. I have to say, it was very good – I’d like to see some more of that. I got a rotten cold 2 days before I left, but fortunately it was much better, and I wasn’t too disgusting on the plane, thank goodness, despite the usual horrible recycled airplane air. JFK airport does not impress – very long queues at passport control. But I did get a proper yellow New York cab to my hotel, which was cool. And so I arrived safely in New York! You are currently browsing the Destroy All Onions! blog archives for September, 2013.